What Makes Our Pain Management Physicians Different? 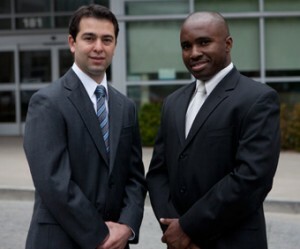 Our Pain Management Doctors, Dr. Reginald Ajakwe and Dr. Raymond Tatevossian, are fellowship trained by prestigious and fully accredited pain fellowship programs: UCLA and USC. This means that they have spent additional years training in the subspecialty of pain management. Our Pain Management Doctors, Dr. Reginald Ajakwe and Dr. Raymond Tatevossian, are board certified in Pain Medicine by the American Board of Anesthesiology. Not all Pain Management physicians have such a certification which helps ensure standard of care. Since our Pain Management Doctors, Dr. Reginald Ajakwe and Dr. Raymond Tatevossian, are rigorously trained, they are able to treat a wide variety of pain syndromes ranging from low back pain and neck pain, to pelvic pain, headaches and cancer related pain. Our Pain Management Doctors, Dr. Reginald Ajakwe and Dr. Raymond Tatevossian, are on staff at prestigious hospitals in the community where they provide inpatient pain management care. For our patients, this provides continuity of care from the outpatient to inpatient setting. Our Pain Management Doctors, Dr. Reginald Ajakwe and Dr. Raymond Tatevossian, always offer all possible therapeutic modalities including medication management, spinal injections and minimally invasive surgical procedures. Our Pain Management Doctors, Dr. Reginald Ajakwe and Dr. Raymond Tatevossian, regularly lecture in the community on various Pain Management topics. Both doctors moderate Pain Medicine education lectures at Providence St. Joseph Medical Center. We believe in a comprehensive approach to pain management using evidence-based medicine to maximize conservative treatment before considering more invasive modalities. This includes physical and occupational therapy, complementary medicine, prescription medications and spinal procedures when appropriate. Our Pain Management Doctors, Dr. Reginald Ajakwe and Dr. Raymond Tatevossian, are active members of all major pain societies and routinely attend conferences. This means that our doctors keep up with new advances in the field of Pain Medicine. Our doctors are well experienced in Stem Cell and Platelet Rich Plasma procedures for Joint as well as Spine degenerative conditions.